Guitarists making waves in the music world, their new recordings and gear! The family radio was always on and the pop/rock songs of the day became ingrained in my psyche. In fact, while in the 5th grade, I remember playing Name That Tune, and being able to identify songs and artists within the first few notes. I recall the teacher and kids looking at me in disbelief. My life forever changed at 13, when I first picked up a guitar. Even though I couldnt yet make any musical sounds, I loved just holding it, how it looked, even how the case smelled! Shortly thereafter and not surprisingly, I began opting out of after-school sports. Although I had some formal lessons, I am primarily self-taught, spending countless hours on my bed with a cassette deck trying to mimic my heroes. At school dances, Id be at the front of the stage staring at the guitarists hands oblivious to the fact that people were actually dancing. I began playing professionally at 18, and since then, have played in numerous cover and original bands, taught guitar, and released three instrumental CDs. Today, I am just as passionate, if not more so, about music and the guitar. 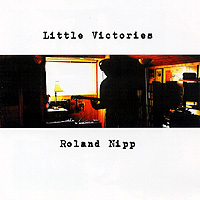 My third and latest CD, entitled Little Victories, is electric guitar music for song lovers. When I was writing the album, I asked myself: What do I want to hear as a music fan, what qualities do my favorite CDs have, what brings me back for repeated listens? The answer came pretty quickly, its all about the songs. My goal became creating music to connect, not to impress. Once this ground rule was set, it was easy to write and play from the heart, and the songs essentially wrote themselves. To paraphrase Santana: to play with soul and purpose, we must first get our ego out of the way. I am also drawn to the thinking of the late Philip Sudo, who, in his book, Zen Guitar, says true guitar virtuosity is beyond technical mastery, its about playing with virtue, honesty, integrity, compassion, and gratitude. The album itself is a loose concept about finding/looking for the little victories that can occur in everyday life. It reflects much of what is common to all of us: love, struggle, hope and freedom. Theres a song on the CD called The Ride, of which Im really proud. Its a metaphor for life, its been described as dark, gutsy, contemplative, powerful and exhilarating. I recorded the album in my home studio on a PC Pro Tools setup. After a song is written, I will literally spend weeks creating the drum part with Strike (virtual drummer), and then track the guitars, bass, keyboards and percussion one part at a time. Because there are no vocals, you really need to pay attention to the arrangement, dynamics, tones, textures and effects to set up the different transitions that occur in each song. Consistently throughout the process, Ill give a critical listen. If the music doesnt raise the hairs on my neck, Ill rethink the part or sound. By the time a song makes it on to my CD, Ive heard it hundreds of times, and its passed my intense, unforgiving, microscopic scrutiny! For guitars, I played my precious Holy Trinity: a Fender Stratocaster, Telecaster and Gibson Les Paul Standard. I wish I could say I recorded through a multi-boutique amp setup, but I cant. As the album was recorded in the bookend hours of everyday life, while my dear wife and daughter were sleeping, I recorded all the electric guitars through my trusty pedal board and Line 6 POD. I tweaked the POD and my effects until I got the sound I heard in my head. I believe much of the sound, however, comes from the musicians heart and hands. For live playing, I use a Vox AC30CC2X and Fender Hot Rod Deluxe. I love guitar pedals and use a variety of them. For distortion, I have a Rat 2, Boss Metal Core ML-2, an old Ibanez Mostortion, and a Digitech Brian May pedal. For effects, I favor an MXR Phase 90, Boss BF-3 Flanger, Line 6 Roto-Machine, Boss DD-3 Delay, Boss TR-2 Tremolo, and Dunlop Crybaby Wah. My CD collection is all over the map. In one listening session, I may go from Rushs Permanent Waves to Sarah McLachlans Solace, from Django Reinhardts Djangos Blues, to Keith Jarretts The Melody at Night With You. Throw in old Motown, vintage Heart, Vince Gill, Steely Dan, Coldplay, disc 2 of The River by Springsteen and there you have my typical evening! Im also greatly inspired by the multitalented musicians who at one point wrote the songs, and performed most of the instruments on their albums: Paul McCartney, Stevie Wonder, Tom Scholz, and Steve Winwood. Attention Artists and Record Companies: Have your CD reviewed by mwe3.com.